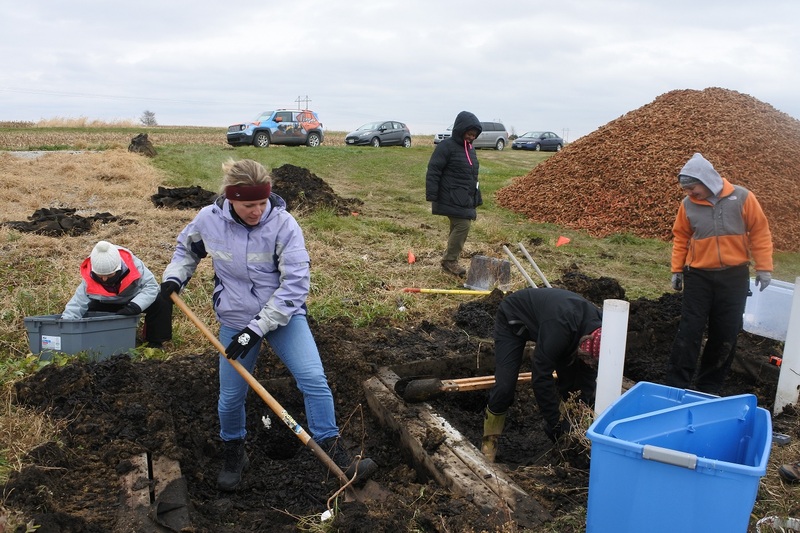 AMES, Iowa — On a cold day last fall, Iowa State University scientist Michelle Soupir and her team of graduate students shoveled out the woodchip-and-mud entrails of nine concrete-lined water-quality cells at the Agricultural Engineering and Agronomy Research Farm near Ames. They packed samples from the cells — mini-bioreactors — into plastic bags and labeled them to take back to the lab, where they would measure bacterial activity and the rate of woodchip decomposition. Their work wrapped up one set of research trials and marked the beginning of new experiments using corn cobs instead of woodchips. A hill of corn cobs donated by Green Products of Conrad, Iowa, waited nearby to fill the now-empty 19-foot by 3-foot research-sized bioreactors. This pilot-scale system for bioreactor research is unlike any other in the world. Soupir, an associate professor of agricultural and biosystems engineering at Iowa State, is one of the country’s leading researchers studying bioreactors and how to make them effective and practical. A bioreactor is an edge-of-field water-treatment technology that is used to treat nitrate-nitrogen in tile drainage coming from crop fields. At the field-scale, a bioreactor is a plastic-lined trench, where water piped in from tiles interacts with a high-carbon material like woodchips or corn cobs. The environment in the bioreactor supports microbes that transform nitrate-N primarily to harmless nitrogen gas. Water leaves the bioreactor cleaner before it flows on to waterways or ditches. Research on this technology has been ongoing since the early 2000s at Iowa State in partnership with USDA Agricultural Research Service researchers located on campus. With the adoption of the Iowa Nutrient Reduction Strategy science assessment in 2012, bioreactors started gaining prominence as a promising edge-of-field practice for nitrate reduction in Iowa, and the technology is catching on in other states that have extensive agricultural drainage. Soupir’s pilot-sized bioreactors were installed in 2014, with funding from the Iowa Nutrient Research Center at Iowa State. The center continues to fund Soupir’s bioreactor research and has also supported development of curriculum that uses bioreactors to teach science to middle-school and high school students. Soupir’s research also has been supported by the Iowa Soybean Association and the USDA Natural Resources Conservation Service. Soupir’s new Iowa Nutrient Research Center-funded project, now underway, is exploring the next generation of bioreactors — assessing the potential of corn cobs as a carbon source to fuel helpful bacteria to denitrify water. “In the lab, using corn cobs has been shown to increase nitrogen removal because they are more biologically active than woodchips,” said Soupir. Soupir and colleagues monitor nitrate-nitrogen and phosphorus levels in water as it enters and exits the bioreactor. To date, her research shows that many factors influence a bioreactor’s effectiveness, including its size, the flow rate of the incoming water and the levels of nutrients it carries, temperatures and carbon source. The research indicates that bioreactors remove from 9 to 54 percent of the concentration of incoming nitrate-nitrogen, depending on conditions like flow rate and temperatures, Soupir said. 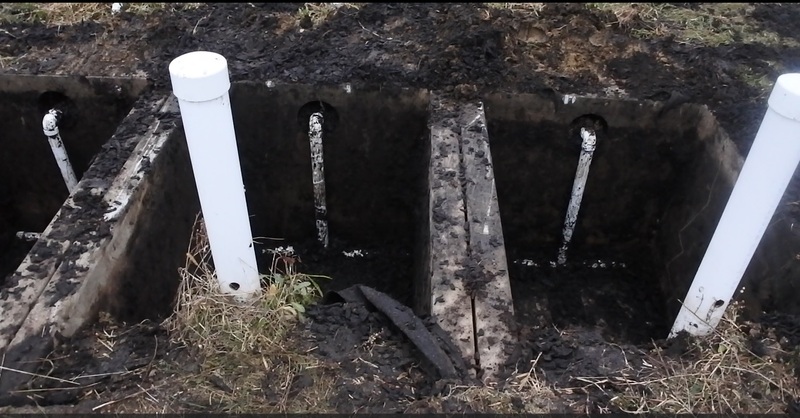 In wet conditions when water flows through more quickly, the bioreactor may remove a lower percentage of nitrogen in the tile water, yet reduce a larger overall pollutant load. The cost of installing a bioreactor is estimated to be $10,000 to $15,000, depending primarily on its size and the materials used as a carbon source. That roughly equates to $10.23/ treated acre per, a cost similar to estimates for other edge-of-field technologies like saturated buffers and constructed wetlands. In terms of lifespan, a woodchip bioreactor is predicted to function about a decade before it will need to be recharged with a new carbon supply. In 2018, Soupir, Ji-Yeow Law and other colleagues in the Department of Agricultural and Biosystems Engineering, published findings looking at the potential to use electrical stimulation to ramp up biological activity in the bioreactor when temperatures drop. Another Iowa State study showed that bioreactors can help reduce E. coli bacteria, for example, from livestock facilities. The Iowa Nutrient Research Center was established in 2013 by the Iowa Legislature to pursue science-based approaches to evaluate the performance of current and emerging nutrient management practices, and provide recommendations on implementing the practices and developing new practices. The center has supported 76 research projects, led by scientists at Iowa State University, the University of Iowa and University of Northern Iowa, often in collaboration with other agencies, organizations, cities and landowners. Professor Michelle Soupir (in purple jacket) working at Iowa State University bioreactor research site with students. Pilot-scale bioreactor cells cleared out for new carbon source of corncobs.